The Initial D manga and its corresponding anime series having been going strong for well over a decade now, combing high-octane street racing thrills with a distinctive animation style and plenty of drama. This new outing from Madman comprises the first 12 episodes of the amine’s Fourth Stage, which originally aired in 2004 and 2005. The episodes focus on Takumi Fujiwara, a renowned street racer who has joined the seemingly unstoppable Project D racing team. Together with allies like the formidable Ryosuke the team takes on all challengers, in a series of scenic nocturnal locales and with the aid of some of the most powerful Japanese vehicles around. 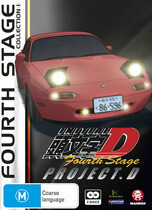 Rev heads will certainly find much to recommend this first half of Stage Four, which contains more action and more nuanced relationships, both in and out of the Project D circle, than some of its predecessors. The animation style is again strong, and though some of the character designs tend towards the generic the cars and the racing sequences are within exception artfully staged and executed. The series is also served by an expansive anamorphically enhanced 16:9 widescreen transfer. Though there are no bonus features the present set is still an excellent and action-packed outing that builds well upon previous seasons and throws some exciting new elements into the mix. With a running time of five hours these 12 episodes are bound to keep even the most ardent fans entertained, and will likely have stalwarts and newcomers alike clamouring for Collection 2.